Encompassing the flowing Yangtze river, the Yunnan valleys and the highest peak on earth, Mount Everest, China is a vast country that displays impressive variety in its geography. The country boasts a number of different climates, which foster many types of native plants and flowers. Many Chinese flowers can be cultivated in gardens throughout the world. A member of the bean family, Chinese wisteria (Wisteria sinensis) is a small deciduous tree or woody vine native to China. The fast-growing plant is prized among gardeners for its cascading blooms, which are heavily fragrant and available in colors ranging from purple to lilac, blue or white. The vine does well in a range of conditions and will thrive in USDA hardiness zones 3 to 9. The plant prefers a sunny location and a well-draining, average soil. Water the plant as needed, and prune if desired. Chinese wisteria is considered invasive in some areas, so check an invasive plant list before cultivating. The less aggressive American wisteria (Wisteria frutescens) is recommended for gardeners in Florida. Blossoming as early as mid-winter, Chinese jasmine (Jasminum polyanthum) is a sprawling shrub or vine that boasts glossy green leaves and heavily fragrant, waxy white blooms. A native of China, Chinese jasmine may reach up to 10 feet in length. The plant is commonly used as a fragrant border, or as an accent to a trellis or entryway. The vine is adaptable to a variety of soils, from neutral or alkaline to acidic. Chinese jasmine is a warm weather lover that is best suited to cultivation in full or partial sunlight in USDA zones 8 to 11. The plant may have a prolonged bloom period in warmer zones. Water the vine as needed: more in the summer, less in the winter. A member of the nightshade family, devil's trumpet (Datura metel) is a flowering annual native to Southern China and parts of Asia. The plant reaches an average height of between 3 and 5 feet, sporting broad, jagged green leaves and purple-tinged white flowers, which are trumpet shaped. Flowers may also be pure white, yellow or bluish. Devil's trumpet grows best in full sunlight in USDA zones 7 to 10. An average, moisture-retentive soil is fine for this plant, which only requires water during summer droughts. 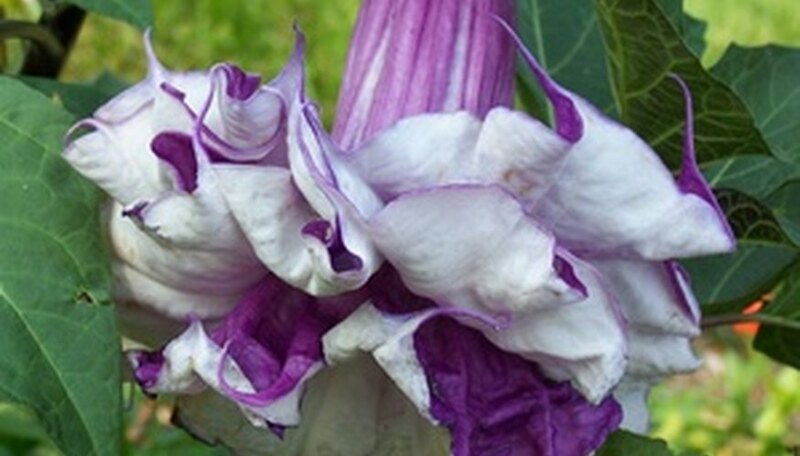 Like other members of the nightshade family, devil's trumpet is highly toxic. Children and pets should be kept away from the plant, as it may cause serious illness if ingested.